Universal Islands of Adventure is a park built on heroes, adventures, and memorable journeys. The newest adventure is the Wizarding World of Harry Potter where you can ride one of the most technologically advanced rides in the entire world, The Forbidden Journey. Whether you are a thrill seeker, young or young at heart, or into exciting shows Islands of Adventure has something for everyone. 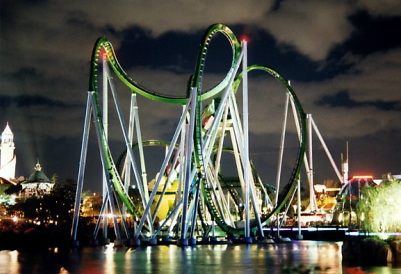 The thrill seeker will love the two of the best coasters in all of Florida, The Incredible Hulk and Dragon Challenge. Also, most everyone will enjoy the 3D ride The Amazing Adventures of Spider Man, a one of a kind ride that combines virtual reality with a moving ride vehicle. If thrills are quite your thing there are other great parts of Islands of Adventure. Explore the world of Dr. Seuss in Seuss Landing and take a ride with the Cat In the Hat. Head over to Super Hero Island and watch the super hero parade or back to the Wizarding World of Harry Potter and meander through Hogsmeade or the castle. Finally, if education and science is your thing head back to Jurassic Park and visit the research center or if you are feeling good about yourself try the Jurassic Park River Adventure. Finally, if shows are your thing you cannot miss The Eighth Voyage of Sinbad or the amazing special effects show at Poseidon’s Fury in the Lost Continent. CLICK HERE for a free Universal Orlando vacation quote from Big Dreams Travel.